To craft a unique guest experience, McHenry let narrative drive the design process. 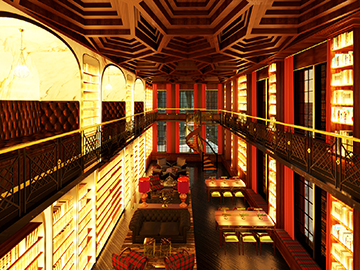 The hotel’s design is based on members of the fictional Batts family who owned the hotel in the 1920s. The building he chose to repurpose, the 120-year old 5 Beekman Place, a former office building near City Hall that contains one of the most spectacular atriums in the city (see illustration top left), provided the perfect skeleton on which to hang McHenry’s macabre story. The hotel has 90 guest rooms, each one with angled walls to reinforce the overall effect of the macabre and the unexpected (see illustration left). The building program also contains nine public spaces, and for the purposes of his thesis project, McHenry fully articulated three. De Vera (see illustration below right), inspired by the matriarch of the family, Winifred Batts, is a luxurious retail space located off the main lobby where guests can purchase antiques and jewelry. The inflexible personality of Winifred’s domineering husband, George Batts, the Ambrosine’s owner, permeates The Archive, the stately bookstore/library (see illustration bottom left). A spectacular subterranean space, a theatrical performance bar called Adelaide’s Chamber (see illustration top right), is an interior design portrayal of the Batt’s daughter, Adelaide, an intellectually disabled recluse who the parents were deeply ashamed of. McHenry’s next act? In less than two months after graduating he has landed a junior designer position at Kravitz Design Inc., the design and product development firm founded by Lenny Kravitz in 2003.